Trust was the issue at the heart of last nightï¿½s show; but along the way, we saw real evidence of learning. The task was a familiar one to fans of the show: look at a range of goods pitched by the vendors, select which ones you believe you can sell best and hope to be the team chosen to sell them.ï¿½ Then sell your socks off.ï¿½ In last nightï¿½s show, the target market was the over 50s, at an over 50s fair at Londonï¿½s Olympia exhibition centre.ï¿½ If the previous adult candidates thought pensioners were another species, the over 50s must seem very alien to these teenagers.ï¿½ Never mind: Haya has a grandmother who is over 50 and Harry Maxwell even has parents that old. However, knowing your parents is clearly not enough of a business edge and Haya Al Dlame took the Atomic helm, leading Harry M, Lewis Roman and Hayley Forrester. Harry Hitchens and James McCullagh squared up to lead Kinetic , with James getting the votes needed to lead Gbemi Okunlola, Zara Brownless and Lizzie Magee. lament what went un-chosen (ï¿½If only theyï¿½d gone forï¿½ï¿½). Is that show the right market for this product? Is this something demonstrate and sell well? I think both low-price good ï¿½ Atomicï¿½s Pie maker and Kineticï¿½s Mini vac ï¿½ were good choices. … and robertus est fratris matris tuae. Who could speculate about the comfort cushions.ï¿½ If I have my numbers right, the sales volumes would have had to be huge to match sales of pie-makers or mini-vacs. The bigger items were always going to be a harder sell.ï¿½ Shopping trolleys are a minority item by virtue of most over 50s being very physically able and not needing them, and the bird nesting boxes with camera mounts were bound to be a minority interest. Despite failing to negotiate a discounted price, Harry H and Lizzie demonstrated the vacuum cleaner really well and made the sales.ï¿½ I was pretty impressed with their team matesï¿½ trolley sales too ï¿½ selling three was an achievement.ï¿½ I tended to agree with James that, on the evidence the editors showed us, Zara did not seem enthusiastic in the selling task.ï¿½ James, however, was in his element.ï¿½ Gbemi seemed to fade into the background a little. I was also amazed that Harry M managed to sell 5 bird boxes.ï¿½ His initiative in selling the ugly flower last week was repeated in doing the rounds of stall-holder trying to make trade sales this week.ï¿½ Full marks for tenacity, initiative and determination.ï¿½ These are character traits that made the young Alan Sugar successful and that will stand Harry much credit, I think.ï¿½ Hayley seemed once again to be a passenger this week ï¿½ a fact Lord Sugar picked up on ï¿½ but letï¿½s acknowledge that she was credited with a sale too. ï¿½Not ï¿½25 ladies and gentlemen; not even ï¿½20. Go on rob me: Iï¿½llï¿½ let you take one home for just 5 notes. Put them here and Iï¿½ll throw in this pie my colleagueï¿½s just cooked up. That takes a certain sort of confidence (Jamesï¿½s?) but neither Lewisï¿½s constant flow of nonsense, nor Hayaï¿½s professionalism (remember her great pitch in week 2) were up to the task of selling like this. Haya learned from tales of last week: donï¿½t take the strongest performer in with you even if you had a row with him and disagreed vehemently.ï¿½ So she took Hayley and Lewis. Once again, I anticipated and completely agreed with Lord Sugarï¿½s decision and reasons. Hayley Forrester has been quiet and a subtle contributor, but this show also needs stamina and she has remained composed .ï¿½ As the louder, pushier, weaker candidates diminish, there are opportunities for tortoises to overtake hares and to emerge from their shells.ï¿½ I would like to see what she can do.ï¿½ Like Susan Ma in the summerï¿½s series, Lord Sugar and Karren Brady questioned ï¿½has she enough power?ï¿½ Weï¿½ll learn more soon, I think. If Haya Al Dlame avoided Hannahï¿½s mistake from last week, she made another decision error.ï¿½ In choosing her products, she did not listen respectfully to her team members.ï¿½ Harry M and Hayley had seen half of the potential products, but Haya favoured only the ones she had seen.ï¿½ A fundamental cognitive error in failing to recognise that what is unseen can be as good as what was seen.ï¿½ We can never know whether the error cost her team a win, but Lord Sugar took her lack of trust and confidence in Harry and Hayley so seriously, that he gave her perhaps the roughest ride any candidate has had in the boardroom to date. Lewis Roman has been a weak candidate from the start.ï¿½ His confidence problem is that he has too much and it is misplaced.ï¿½ His trust problem, is that he does not trust himself to say one thing, say it well, and then stop.ï¿½ He over-speaks in virtually every encounter we have seen him in.ï¿½ And he speaks before he thinks, meaning that we hear unformed ideas of little value.ï¿½ He should have gone last week, but Hannah did not bring him into the boardroom. 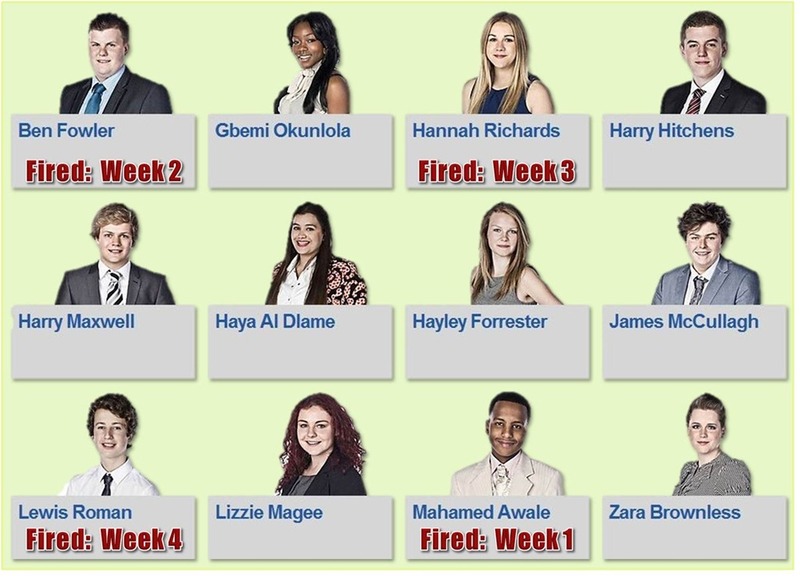 Gbemi was equally lucky last week, and was on the winning team last night with little contribution that we were shown.ï¿½ Both Harrys had a good week this week as did James, whose extreme commercialism, whilst annoying me, may carry him further.ï¿½ Zara and Haya disappointed me this week and Lizzie and Hayley remain somewhat unknown quantities.